I’ve long been a fan of Amy Poehler’s. My favorite movie of hers is Wet Hot American Summer, which came out before she appeared on Saturday Night Live and will soon be revived as a TV show on Netflix. I follow Amy Poehler’s Smart Girls at the Party on Facebook, Twitter, and Instagram. Not only is she funny, but she seems down to earth. 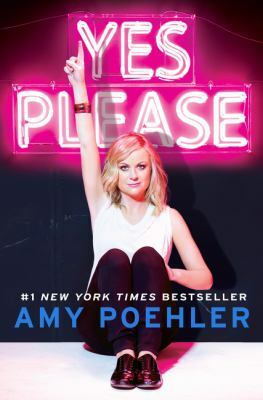 When I heard she wrote a memoir called Yes Please, I couldn’t wait to read it. Amy chose the title Yes Please because the word “yes” calls back to her improv days (saying yes is the first rule of improv), and “please” means you’re agreeing to not do something alone. She also likes to use the phrase in her personal and professional life. I like that it sounds polite. Yes Please is written like a series of essays. In the early chapters, Amy describes her family and growing up in suburban Boston, where not much happened so she compensated for that with an active imagination. She also gives helpful life advice, such as “treat your career like a bad boyfriend.” There are several shout-outs to Judge Judy, who I also admire. Improv has played a huge role in Amy’s career and life. She fell in love with it while playing Dorothy in a grade school production of The Wizard of Oz. She writes about her time with the Upright Citizens Brigade improv group, where she met Tina Fey (whom Amy calls her “comedy wife”, and gets a chapter in the book), Rachel Dratch, Stephen Colbert, among others. There are stories about her time on SNL, good and bad. (Although she doesn’t dish about which celebrity hosts behaved badly.) She writes about making her SNL debut after 9/11, which was poignant. I remember watching that first episode later that September, where in the cold open SNL creator Lorne Michaels asked then-Mayor Rudy Giuliani for “permission to be funny”. Amy admits to laughing on-air during a Debbie Downer sketch. The characters in the hilarious Bronx Beat sketches, performed with Maya Rudolph, were named after two ladies in the SNL hair department. In the chapter “Sorry, Sorry, Sorry”, Amy talks about a skit that offended a mutual acquaintance that she took a long time to apologize for and her regret over the delay. It’s hard to choose a favorite chapter from Yes Please, but a contender is “The Day I Was Born”. Amy believes everyone should know about the day they were born. She tells her birthday story, with input from her parents. This prompted me to ask my parents about the day I was born. One highlight from my birthday, according to my mom, is when she found me in the nurse’s station hours after I was born having my hair combed by two nurses. I was born with a full head of red hair, and stood out from the other babies in the nursery. Amy wrote an entertaining chapter about being nominated for major acting awards like Golden Globes and Emmys, which she nicknamed “the pudding”. To make the experience more fun and less stressful, she planned bits with her fellow Best Actress in a Comedy Emmy nominees. At the 2011 Emmys, Amy and the other nominees came on stage as their names were called and held hands like pageant contestants waiting to hear who gets the crown. The winner Melissa McCarthy received a bouquet of roses and a tiara in addition to “the pudding”. After I read Yes Please, I loved Amy even more. I’m planning to listen to the audiobook of Yes Please, just so I can enjoy this wonderful book again. This is my second post about funny lady memoirs, which I plan to continue as a series. (The first post was about Tina Fey’s book Bossypants.) Rachel Dratch has a memoir that I want to read. I’d love to read memoirs by other SNL performers, such as Maya Rudolph, Ana Gasteyer, and Kristen Wiig. Publishing execs, please give these ladies book deals! Who are your favorite funny ladies? Do you know the story of the day you were born?